Wang Lin is a very smart boy with loving parents. Although he and his parents are shunned by the rest of their relatives, his parents always held high hopes that he will one day become someone great. One day, Wang Lin suddenly gained the chance to walk the path of an immortal, but found that he only had mediocre talent at best. Watch Wang Lin as he breaks through his lack of talent and walks the path towards becoming a real immortal! This novel is only the second Er Gen novel I have read. The first one, ISSTH, has been kinda dropped by me after the drastic drop of quality after the point where Meng Hao's cultivation went past Spirit Severing. This one instead has its ups and downs, but generally the story-line quality has been kept consistently decent even after more than a thousand chapters. Li Muwan dies, some time after 300 chapters or so. Wang Lin's quest to revive her is basically the overarching plot of this novel. The ending was satisfying. The only disappointing (and frustrating) part was the boring romace. The storyline focus on different phases of MC's life (innocent toddler to eccentric expert). Er Gen has done each phase very well. For the first time readers the starting 100-150 chapters might seem bad. I can understand that as those chapters focus on MC's transction from a naive... more>> child to a ruthless cultivator instead of action. Later on you realize the importance of those chapters when the series take a dark tone. The starting chapters are light hearted and yet tell the dark side of world. At start MC is hesitant to kill even after learning that the world follows the law of jungle. Er Gen smartly wrote the transction of a naive child to a ruthless cultivator. You could actually feel the hesitancy MC shows as he steps on the dark side. Later on he becomes totally ruthless but the starting of series provide the reasons. Some would say that it's a revenge story. Believe me this is not the usual stupid revenge tale. Xian Ni is 2K+ chapters but the revenge part hardly last for 100 chapters and even in those chapters more than 50% of them are focused on outside adventures. In other tales you always root for MC but in Xian Ni you would actually feel sad for the bad guys. The revenge arc was full of bittersweet moments. The best part was the epilogue of revenge arc...I won't spoil them for you but believe me they are the most beautiful chapters a xianxia series can have. The most unique part of the series is that Wang Lin's life is full of tragedy unlike other xianxia. Sure MC is lucky in cultivation but he's hardly happy. The storyline is grim and even the death of minor characters would make you sad. Xian Ni.. It was a series that I was very reluctant to read or even try to read due to all these comments about it not being a very good story or MC being too heartless and not likable or no character development or there being no romance. Honestly speaking I dont regret a single moment since the first time I started reading to the point I am at currently. It has a great story with a world that just keeps getting bigger and bigger. MC feels very unique... more>> and likable. He is smart and cunning.. Not just from the perspective of the characters inside the book, but you feel it yourself while reading it. On top of that you can tell exactly how brilliant Er Gen is from the way he writes his character. They all feel unique and fun to read about, the characters make you emotional, mad and sometimes you just cant help but have a dumb smile on your face. I also want to point out that MC doesnt get Super strong from the start and he has to actually struggle and fight with his mediocre talent, you can actually see him struggling which I find very refreshing. To summarize, you see a little innocent village boy with almost no talents in cultivation, a person who is just trying to make his parents proud by following the so called immortal cultivation path slowly getting to know how ruthless the cultivation world actually works, which in turn end up turning our MC into a ruthless cold hearted person who will kill anyone that means to do harm to him or anyone close to him. One of the better Xianxia you'll find. The story is not as formulaic as other xianxia and it always keep things interesting by mixing it up. The MC's adventure is interesting to read and not just go here -> insult this generic villain -> find treasure -> kill villain's entire family. Villains in this novel has personality and not just some jumped up rich boy who gets offended by everything that the MC does. The pacing is also excellent. You don't feel like the MC is rushing from one thing to another with no stop like some other xianxia (cough cough Martial World). Took off one star for the horrendous romance. Er Gen knows how to do many things but romance is not one of them. The main love interest is a non-character that is somehow the "driving force" for MC even though their time together is shallow to say the least. There's a quasi harem that gets going but you will end up feeling sorry for the harem member more than anything else. Overall, if you discount the romance this is a must read. Especially if you are tired of formulaic and repetitive xianxia. This story is SERIOUS. I liked Er Gen for I Shall Seal the Heavens and A Will Eternal, but the feeling I got from this story was completely different. I was deterred from reading this story for a long time by a review that said the MC became an arrogant and horrible person. The MC goes through immense struggles and turns into a ruthless person, but he's never a cruel person. It's just a cruel world. The MC may act like a demon sometimes, but his pain and emotion is... more>> just as prominent. I have never been as emotionally invested in a character as in this one. Having caught up to the translations, I am feeling so sad that I'm writing a review for the first time in a few months. I can firmly say that this is my favorite story ever. Please read this story. I'm surprised this isn't higher rated. Usually with bad stories I can understand why they dislike it, but a lot of the reviews seem ridiculous to me. Yes, he is not the kindest person ever. That's because the author is willing to make a complex character. In most Xianxia you have an amazing person who is never put into a situation complex enough to result in anything hurtful happening to anybody not a horrible person, and everybody who is not on the MC's side is a horrible person. Yes, the heavenly artifact is put aside a lot. I find that a lot more interesting than Wu Don Qian Kun, where the artifact gives him everything he ever needs. The MC actually needs to work hard and have more than just an artifact. No, to the people saying he has no clear goal. There was only some time after the revenge plot before he has a very important purpose again, and that's not the bead. Even if you don't include that, Er Gen really likes to focus on how power is everything. The MC obviously wants the power to protect his friends. Most Xianxia protagonists just cultivate for no reason. Have to agree this is an accurate summary of the story at least up to chapter 300 which is where I dropped it. He powers up, gets revenge, then continues powering up for no apparent reason (oh yeah, to free that old man in the marble, I forgot that since it literally happened 400 years ago). The comment about time scale is extremely accurate. MC secluding himself and training for 400 years straight is considered NORMAL. There are people waiting THOUSANDS OF YEARS for a plan to hatch. Distances in the millions of kilometers are used to describe the length of an ocean. There are Gods who can literally eat planets, and these Gods have physical bodies which survive for MILLIONS OF YEARS that MC can somehow travel in. The sense of time and space is totally distorted. I heard by the time MC travels back through the ocean to his love interest she died of old age already... that is in line with the rest of the novel. Lightning bolts... yeah, you can’t eat them. Don’t know if this is a translation error but... yeah, you can’t eat lightning bolts, sorry. idk why the author thinks you can eat lightning bolts as if they're physical objects or something. Also, MC comes back to avenge his family... in the process of doing so he causes the death of his only surviving family member. This guy is not smart, I’ll tell you what. I see a few things people complain about a lot that I'd like to retort. He's not evil, he doesn't go around killing people for fun or kill someone just because they annoy him. He doesn't kill people even if they have something that benefit him, he'll ask them first and only if they try to kill him will he kill them. Although this is a fantasy world, at least this type of personality is much more aligned with the real world. Real men will do... more>> whatever it takes to get what they want, and destroy anyone that stands in their way. As you can see all the most powerful and wealthy people in the world aren't saints. Either way, this is how it should be. If God stands in your way kill God, if Buddha stands in your way kill Buddha. The Christian God wipes out the entire planet, wages war, and mass murders regularly throughout their bible. Why do they still worship it? Because power is everything. With power, it doesn't matter what you do. Might makes right. This is novel is a whole new take on cultivation novels. This story is so compelling that in all my years of reading xianxia this is the first one to make me attempt learning Chinese. That should be enough to explain it. 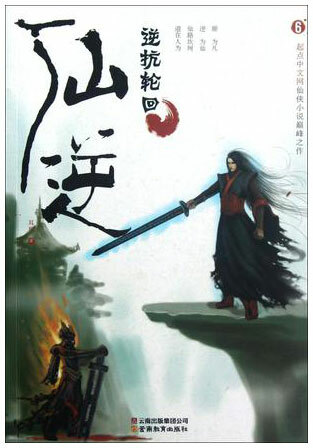 As a novel created by Er gen, we can expect great things such as a story that stands out among the many generic wuxia/xianxia novels, a smart main character with an equally firm determination, immersive world of immortals, and unique ways of fighting and cultivation methods. Since this novel proceeded issth, you can clearly see many similarity and will be delighted to see where the author gets its inspiration on writing things we loved from issth. The pacing... more>> is a bit slower than issth which provides the story to develop with a clear understanding. The main character has a similar personality as meng hao, especially at the beginning of the story, just a lot colder and less comedic because of things that happened in the story. Revenge seems to play a big part in the current arcs, but I can see him moving past this after we move on the story and delve into bigger issues as the main character is becoming more involved in the events of his world. How to start. Let's see. One of the greatest novels possibly ever written in the Chinese Xianxia/Wuxia genre. The depth of this story is many fold that of any other. From its character development, of its protagonists, to the world of struggle, and conflict that surrounds him (Wang Lin). When I started reading I thought that it was the usual revenge story with the MC being OP thanks to his secret treasure and the secret technique left by the usual grandpa and I dropped it. Later I started again and I have to say that I misjudged it. Initially, I was conflicted about picking up Xian Ni due to the mixed reception from readers. However, after reading Meng Hao's fight with the 10th Wang Patriarch in ISSTH and Deathblade's footnotes, I got curious about how the MC of Xian Ni would develop as a character and as a cultivator. So I decided to finally give Xian Ni a shot. I have to admit I was very surprised by how much I would enjoy reading this novel. AS of C254 you can scratch Romance and Beautiful female lead from the tags. Maybe in the future, who knows? At this time The MC is just a spoiled brat who got bullied and decided to take revenge not taking into account the consequences. The MC is not likable in any way nor is he a saint or a justice seeking person. He is just a person full of hate and kills anyone who looks at him wrong. The Author wrote the story at the 3rd grade level and there is no... more>> plot but just the flow of life theme. This is more slice of life than adventure with lots of killing. It is basically the life of a killer. The story itself is confusing and in no way has any direction but goes on the whim of the author who decides "oh yeah let throw in a grandson to taunt the MC and let the MC kill him so his grandfather can try to kill the MC and kill his entire family... good plot (pat on back) ". As for love interests...... none.... nada..... ZERO........... do not get me wrong, girls like the MC, but he is blind, not dense, but blinded by hatred. This is a fantastic novel! weird cultivation methods and creatures, mysterious law-defying trial realms, soul devourers and wandering souls, different cultures, and -- this part really stands out from most xianxia -- having to revert to a mortal to make a breakthrough. I also find it refreshing that not all foreshadowings actually come true in this novel, and that he joins so many sects at different points in time XD. Admittedly, some ideas have holes in them like being able to travel through space, but I'm the type of reader that's like meh. The MC is likeable. He's decisive and smart, and he knows when to take risks. He's ruthless but he has his reasons for it, plus he mellows over time, in certain situations. He's not humorous like Chu Yang (again, Lone Wolf tag), but he's not bad compared to other MCs. There is some romance. Barely. Sadly. But it really is impractical for him to have a serious romance at this stage, as an unaffiliated lone wolf. That would just get the both of them killed. Sometimes there are clusters of chapters where he just fights and it feels tiring to read. But his devils give some comic relief in the middle. And it all pays off when you get to his experience in the mortal world! It reminds you that our MC is still human. Plus, it's NOT just fight-kill-repeat. His situations and environments change enough that it keeps you interested and on your toes. Overall: MC is average. Romance and humor are nearly nil. 3 stars for being likeable. BUT BUT the worldbuilding is awesome!!! Plus that heartwarming experience in the mortal world. So 5 stars!!! The story isn't that different form Er Gen's other works, but the character is. He is not the typical hot headed cultivator. But he is calm, collected, and apathetic. He has no lust (so don't expect a harem much), which is always a good thing, but there is almost no comedy in this series. More than anything, it is the author's attempt at creating a darker hero. Which is good, since it is fresh, compared to the other MC's out there. Most of whom are psychopathic killers who always think they... more>> are in the right. He knows he is doing bad things, but he just doesn't care, because he isn't morally righteous, nor does he pretend to be. He is unforgiving and merciless, and pretty much treats everyone equally bad (even females, so at least he isn't a pervert). And he is silent. He barely talks at all. But its part of his persona. His talent in cultivation is low, but he still relies on some "luck", but its mostly just preparation beforehand and strategy that he uses to defeat stronger opponents (in fact, he usually has to rely on tricks to beat them). But yes, he does end up OP later on, but I don't really read this for the fighting. I read it because the main character is interesting. There is almost no plot (which is common for Xian xia series), except for the cultivate to become a god goal. The world itself is large, but it only gets slowly revealed over time. There are other planets out there with alien cultivators and the like, in massive universes, where it isn't just "human" cultivators. Unfortunately, it also falls under the "side characters don't really exist or don't matter" category as most xian xia series do. Its sort of like the blazing sun character where everyone else is outshined or doesn't matter. But, there is character development (which is more than I can say for most xian xia series), but it happens slowly. The story also progresses slowly (which is as expected for chinese webnovels). However the world itself and the character more than makes up for the slow pacing. Lets see... the action is fine. There is actually less "skill spam and skill name calling" and more descriptive fighting style. But they are ergen style cultivation battles, so it isn't that exciting (compared to say... Blood and Steel, which has some of the most amazing fights ever). But at least its better than "He uses a technique. It insta kills. Battle over" (though this is only for when he fights people that are equal to him). If you are looking for something a bit different, but still has the classic ergen style xian xia, than this is probably for you. One of the best if not the best xianxia/xuanhuan novels. Since its Er Gen's first novel, it feels unpolished and clunky at times compared to ISSTH and AWE. However at the same time, gives a distinct raw and earthy feeling to it. The cultivation world is vicious with cultivators using the weaker ones as furnaces and turning them into spirit stones. To be kind to someone in this world is to be cruel to themselves. The antagonists, the side characters and the old monsters who've lived for thousands of years act their... more>> age and are not obsessed with face. The plots and strategems between MC and others are brilliant. Unlike some other novels, the reader themselves can feel it and donot need to be told by the author "how smart the MC and the antagonists are". See MGA. The MC. Wang Lin is a naive child who is forced to be ruthless, calculating and cold in order to survive in the vicious cultivation world. At the same time, hes a deeply sentimental person. Coming from a cold and ruthless person, his filial piety, love, guilt, kindness seem much more powerful and meaningful. The tragedies that befell him, and his life experience has given him maturity and a touch of humanity, separating him from cold and emotionless characters like Leylin from WMW or Gu Daoist Master. It also separates Wang Lin from the 1000 year old reincarnated MC's who act like teenagers in heat, obssessed with face and pretentious and moral hypocrites. See Li Qiye, Yun Che, Chu Feng and co. This is one of the rare tragic stories that I read completely, there is no plot armor in the story and it's a sad as MC doesn't trust anyone unless they sacrifice themselves or something for him, and is stubborn on accepting love, at-least the ending is good and justifies his character. it's hard to read when MC commits genocides but if you keep reading it worth the time spent. Wow. Gotta say, this is one of the most powerful and thought provoking stories I have read on this site. For anyone who is questioning whether or not they should start this, go for it. It is a slow burn, but every arc builds upon the other for such a good story. There are many feels moments. This is one of the few novels that gave me such a deep feeling. Er Gen does this story so much justice. I love all the moments in this novel. I would recommend... more>> this to anyone. For those who have not read it, read it. For those who dropped it, pick it back up. I guarantee you will enjoy it. I also love all the Dao comprehension parts in the novel. It makes you wonder, what if? Wang Ling, with average talents, goes through many trials and tribulations. He may not be the most talented, but he works the hardest. It is so great seeing him grow from a regular cultivator to who he is currently. My favorite arc was the one he spends a lifetime with his son. One of the best arcs I have ever read. There are so many great moments in this book, but this one stuck out to me the most. First of all, the complaints about the story is one of the most idiotics. How come readers can complaint a about it when the story goes after beseech the devil. Of course there is a lot that we don't understand given that none of us completely read BTD. And yes there is no romance. This is not because of the author since it was the MAIN plot of BTD. And there is a reason to this. He doesn't have a clear goal except staying alive. What's wrong with that ? He is an everyday people. He doesn't want to dominate the world nor save everybody. He just enjoys life and keeps loving it in it's on way of a lone slaughter. Later on if you read ISSTH you willl know what he became. Er gen does things in a good way with his hidden plot between the sequels. There is a good story plot sonce cultivation isn't just about power up. And people complaining about Wang Lin being heartless isn't true. He is the wang clan patriarch and I won't say more go re-read it. So yeah go read it but if you don't want to get spoiled don't read ISSTH first otherwise it will become tasteless since you lnow what will happens. 2. The main character is done very well at the beginning a child without talent for cultivation wanting to be a cultivator, whilst having a devil whispering into his ear to become one himself. 3. The character personality is great and could be witnessed strongly changes; innocent child, somewhat scheming youth, a youth... more>> against killing innocents, youth forced to commit crimes to survive etc eventually a brutal killer after which acheivig the goal which forced him to become a brutal killer he decided to walk a normal path where he wouldn't kill unless it was absolutely necessary. As for MH he had some good developments but then became retarded again after around c700 which lost my interest at that point but with this, I read somewhat ahead and it keeps getting better!! 4. Cultivation is more difficult as well as has more complications and other aspects.